What makes the perfect day out for your little one? Whether it’s cute animals or exotic creatures, educational play dates or outdoor activities with other kiddies, you’ll be happy to hear that we have them all. 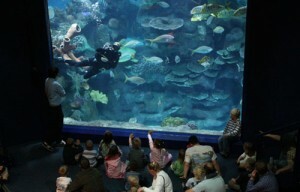 Listed below are 10 must-dos at Blue Planet Aquarium that we’re sure your toddler will enjoy. Did you know that our Aquatunnel is one of the longest underwater tunnels in the world? And to top things off, you can find one of Europe’s largest collections of sharks here too. Wander through and see all our sharks and other aquatic creatures majestically swim over your head. Engage your senses in the mysterious Coral Cave. Venture into the darkened giant rockwork cave and, as you pass, look down through the floor-viewing portholes to the tropical reef below – home to thousands of brightly-coloured fish. Try to spot the Nemos (clownfish) and Dorys (Pacific blue tang)! Ever wondered what it’s like to be in the middle of a tropical rainforest? Go on an adventure at our tropical river exhibit, designed to resemble a branch of the Amazon River. Listen out for the curious waves of bug-buzz and birdsong. That’s not all: this exhibit features a collection of tropical fish too, including the Black Pacu – the largest cousin of the piranha. Surprisingly, the Black Pacu is a harmless vegetarian though! Take a closer look at its teeth and you’ll see they aren’t as deadly. In order to make our resident cuties feel at home, we’ve built one of the UK’s largest Otter Enclosures. Fun fact: these adorable semiaquatic mammals are very playful and will happily take part in group activities just for fun. Don’t just take our word for it though – come and see it for yourself! If you’re feeling brave, get up close with some of the most infamously venomous creepy crawlies and creatures. Watch out for black widow spiders, stinging jellyfish, scorpions, vipers, and more. If you like our furry, eight-legged friends, we dare you to check out the ‘Tarantula Tower’ too! There’s no better plaice *pardon the pun* than our Rock Pools to explore the British Isles’ coastlines without having to brave the typical British weather. This attraction is made up of three giant rock pools, so you and your little beachgoer can take a closer look at some of the creatures that inhabit our beautiful shores. Sadly, many amphibian species are facing the threat of extinction throughout the world – including in the UK – due to disappearing natural habitats. We’ve got an extensive breeding programme to raise awareness and to help preserve endangered British wildlife. Bring the whole family along and do your part! Take a peek at the bright and bold coloured frogs and learn how these amazing amphibians have evolved to changes in their environment. There’s something for every age-group in our talks. Get clued up on how to identify marine animals and all about the dangers our ecosystem may pose to marine life. You never know, your little one may well turn out to be a marine biologist in the making! No visit to Blue Planet Aquarium would be complete without witnessing a dive show at the Aquatheatre. Here, you can marvel at over 1,500 fish and learn all about the magnificent sea creatures, including facts about their home amongst the colourful reef. We know that everyone loves a good playground! That’s why our outdoor playground is equipped with a shipwreck, slides, monkey bars and more, providing lots of fun activities for young explorers to kick off a bit of their energy. We’re open every day of the week, so whether you’re looking for an exciting rainy-day trip or a fun away-day, come and visit us. Book your tickets online now, and take a look at all of our attractions and activities to help you plan the perfect family day out! Don’t forget to pop by the gift shop at the end of your visit and pick up a cute and cuddly gift with your little sailor.